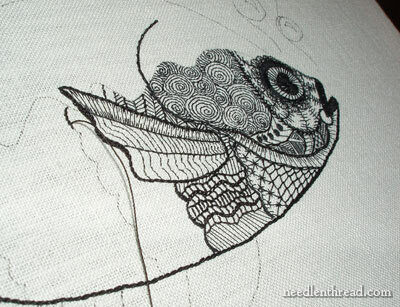 Today’s post is rather short and sweet – just a little internet news – but to make it worth while, I’ll throw in an updated Blackwork Fish Photo! I want to make the fin stand away from the body a little bit, so I’ll be playing with some shading or darker fillings under the edges – we’ll see how that works! Thank you so much for all your encouraging comments on the fish! I really didn’t know if he would go over very well, but I am having fun with him. It’s the randomness, following on the rather rigid work on the pomegranate, that I find attractive right now. Back in January, I mentioned some possible upcoming changes for Needle ‘n Thread, and they’re still coming up! Before the month of April is out, you’ll see a whole new Needle ‘n Thread. The transition will be as seamless as possible, and I’m pretty sure I’ll warn you before it happens, just in case you pop in and think you’ve arrived at the wrong website! If you want to connect with me and Needle ‘n Thread elsewhere on the internet, you’re welcome to! Here’s the connection info for various online haunts. Needle ‘n Thread is my “home base,” of course, but I do use some other networking sites for the occasional bits! Stitchin’ Fingers – not too active on here, but I do like to update and have a good browse now and then. The gallery is fantastic – lots of talented people! I think the fish is looking good, Mary. I would have been afraid of getting bored with black, too, but you are having so much fun with pattern that I don't think that is very likely! The fish is coming along swimingly. Yes, making the fin stand out is good thinking and will be interesting to see it in practice. I went into your flickr site recently to look at the finished pomegranate. Not familiar with the extra sites so was a lovely surprise to see all the photos. I really like the patchwork doodles. Dear Mary, Now whether you do the Lilac Breasted Roller or the Kingfisher first, is fine by me. You see besides having to do my Roller I also have a Kingfisher though not the same one. So glad that you are on Facebook too, expect an avalance of new fans of which I am one of course. Good luck with the new website, looking forward to it!!! The fish is gorgeous! I love this unusual use of embroidery. I haven't commented for long! I've made an Easter break at the country, but even there I read all your posts by e-mail! Now I have to write that I do love that fish! I like much the embroidery with black threads – I'm working on some designs. Your fish has been very inspirational (is this word English??) – you'll see soon, I hope. So the great website transition will happen at April end… I think I'll not be here to follow it but I'll try to follow you wherever I'll may be, lol! About your Calling for Stitches post: I found most of your followers suggested a photo or picture for each stitch! I'm absolutely agree with them – that was the aim of the first multilingual glossary of stitches we did, isn't it? The picture is important for not just beginners, also not English speakers. And you know, Mary, your website is known and read all over the world! Have a great week! Here at last Spring has arrived! I have been following you for almost a year now and will look forward to the updates to your site. Thank you for all you do and I know it will be great! Mas esse peixe está fabuloso! os pontos e a variedade de pontos conferiram ao bordado um destaque surpreendente!